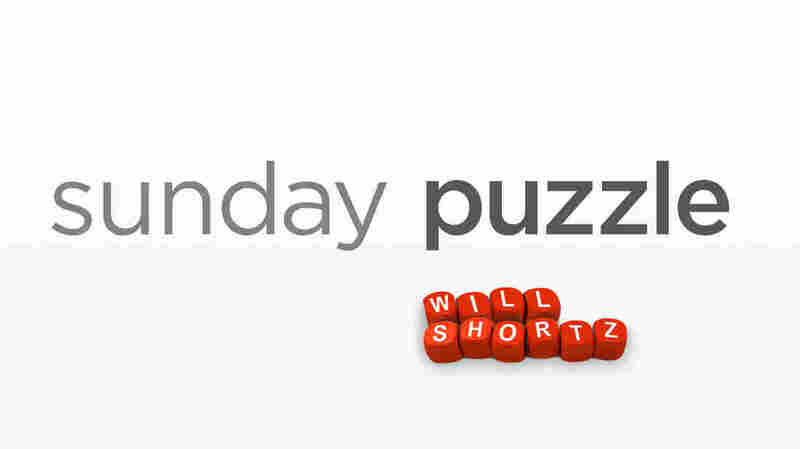 Sunday Puzzle: Decipher These Phrases NPR's Lulu Garcia-Navarro and puzzlemaster Will Shortz play the puzzle this week with Dawn Ladd of New Port Richey, Fla.
Last week's challenge: Name a common article of apparel in 3 letters and another in 4 letters. Rearrange all 7 letters to name a well-known three-word song title. What is it? Winner: Dawn Ladd of New Port Richey, Fla.
Next week's challenge: This week's challenge comes from listener Haig Donabedian of Toledo, Ohio. Apparently it's a spinoff of my challenge of last week. Think of a popular two-word song title in 7 letters. If you have the right one, you can rearrange the letters to name an animal and the sound it makes. What is it? Here's a hint: The title is in a foreign language. If you know the answer to next week's challenge, submit it here. Listeners who submit correct answers win a chance to play the on-air puzzle. Important: Include a phone number where we can reach you Thursday, March 22 at 3 p.m. ET.